Press release from our member group Adalah-NY. Check out photos from the action here. Accompanied by the marching band Rude Mechanical Orchestra, protesters chanted, “Oboe, trumpet, or bassoon / Apartheid is out of tune!” and “IPO gets no ovation / Ambassador for occupation!” In a twice-repeated skit, New York actor and playwright Una Osato – sporting a tie that read, “Drown out the Truth” – conducted the “Israel Whitewashing Orchestra.” Passers-by stopped to watch the “musicians” as they fiddled over the sounds of Palestinian cultural workers’ testimonies about the effects of Israeli occupation on their lives. 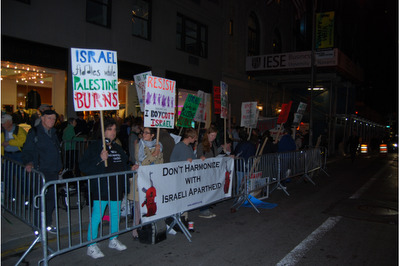 Concert-goers lingered at the Carnegie Hall entrance across the street, listening to the band lead protesters in a version of “Which Side Are You On?” Daniel Strum from Adalah-NY explained, “Tonight we are telling the Israel Philharmonic Orchestra, Carnegie Hall, and the Israeli government that its ‘Brand Israel’ campaign cannot cover up the injustice that Palestinians face.” The IPO will also be met with protests on its tour dates in Las Vegas and Los Angeles later this month. Earlier this week, Adalah-NY made public a letter asking Carnegie Hall not to host the IPO, signed by over 50 artists, including author Alice Walker and musician Roger Waters of Pink Floyd. At the beginning of October, Adalah-NY sent a similar letter to Carnegie Hall administrators and trustees urging them to reconsider the IPO’s appearance, with no response from Executive and Artistic Director Clive Gillinson or any other recipient. One corporate sponsor of the IPO is Israeli billionaire Lev Leviev, whose companies continue to build illegal Israeli settlements in the occupied West Bank and have been involved in human rights abuses in the diamond industry in Southern Africa. Leviev's companies have been shunned by UNICEF, CARE, Oxfam, the British and Norwegian government, Hollywood stars, and international investment firms because of these activities. The protests by US activists and international cultural figures respond to the call from Palestinian civil society to boycott institutions that work to normalize Israel’s occupation of Palestinian territories and the oppression of Palestinians in Israel, in the occupied territories, and in exile. The growing global movement for Boycott, Divestment and Sanctions (BDS) against Israel has gained momentum in recent years, with performers such as Carlos Santana, Cassandra Wilson, The Pixies, and Pete Seeger supporting the Palestinian call for cultural boycott. The Palestinian BDS movement is a nonviolent campaign for Palestinian rights inspired in part by the international boycott campaign that helped abolish apartheid in South Africa.